To provide improved corrosion prevention, the following anti-corrosive measures have been implemented in NISSAN production plants. When repairing or replacing body panels, it is necessary to use the same anti-corrosive measures. To improve repairability and corrosion resistance, a new type of anticorrosive precoated steel sheet has been adopted replacing conventional zinc-coated steel sheet. Galvannealed steel is electroplated and heated to form Zinc-iron alloy, which provides excellent and long term corrosion resistance with cationic electrodeposition primer. Nissan Genuine Service Parts are fabricated from galvannealed steel. Therefore, it is recommended that GENUINE NISSAN PARTS or equivalent be used for panel replacement to maintain the anti-corrosive performance built into the vehicle at the factory. A phosphate coating treatment and a cationic electrodeposition primer, which provide excellent corrosion protection, are employed on all body components. Confine paint removal during welding operations to an absolute minimum. Nissan Genuine Service Parts are also treated in the same manner. 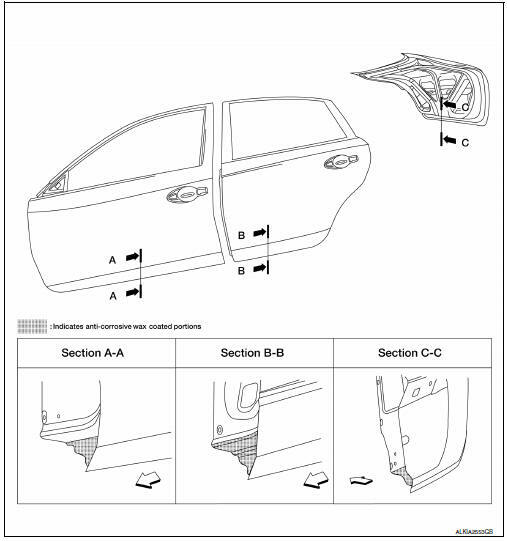 Therefore, it is recommended that GENUINE NISSAN PARTS or equivalent be used for panel replacement to maintain anti-corrosive performance built into the vehicle at the factory. 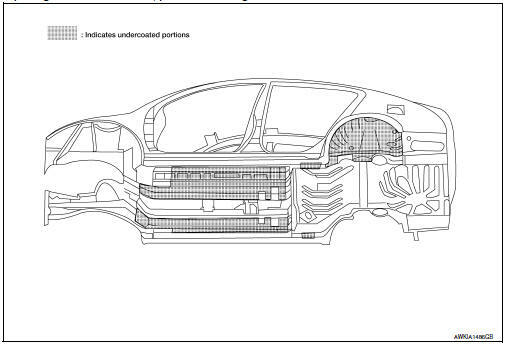 To improve corrosion resistance, anti-corrosive wax is applied inside the body sill and inside other closed sections. Accordingly, when replacing these parts, be sure to apply anti-corrosive wax to the appropriate areas of the new parts. Select an excellent anti-corrosive wax which will penetrate after application and has a long shelf life. The underside of the floor and wheelhouse are undercoated to prevent rust, vibration, noise and stone chipping. Therefore, when such a panel is replaced or repaired, apply undercoating to that part. Use an undercoating which is rust preventive, soundproof, vibration-proof, shock-resistant, adhesive, and durable. Do not apply undercoating to any place unless specified (such as the areas above the muffler and three way catalyst which are subjected to heat). Do not undercoat the exhaust pipe or other parts which become hot. Do not undercoat rotating parts. After putting seal on the vehicle, put undercoating on it.